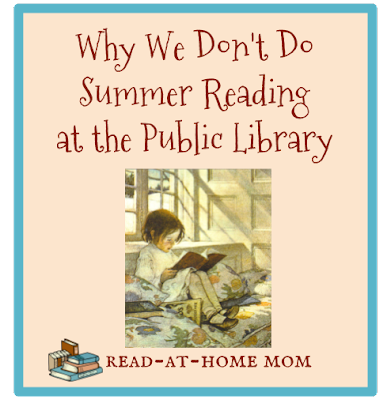 I don't do summer reading programs with my seven year old for similar reasons. She showed brief interest in the Barnes and Noble program where you read eight books to get a free book, but even that paled for her before she finished filling out the reading log. Our library isn't doing the normal summer reading program this year. Instead, you get a ticket for each book you check out (whether you read it or not), and you put your tickets in different buckets for various prizes, ranging from board books to a Kindle. They will draw the winning ticket at the end of the summer. My kid is only one, so he has no idea what's going on with this (which means I get to use his tickets!). I remember loving (and excelling at) the summer reading program when I was a kid, but like you, I'm hoping my own child won't need the extra motivation. He'll just love books anyway! Interesting that the focus is on borrowing books, not on reading them. That is an approach I haven't heard before! I mostly like my library's traditional SRP, which asks the kids to read and report back weekly for a prize. Listeners color a small picture for each book they've listened to while their parents write down one favorite a week. I find it flexible enough for both reluctant and ravenous readers. Even so, I'm unmotivated enough by the prizes that I'm not doing it with my 7yo this year. We also do an extra nonfiction game that encourages kids to explore - both my kids have loved this in the past. I like the sound of this program - simple, fun, and focused on books. The nonfiction game sounds great too! My 12yo is trying the teen program, which this year calls for reading a book set on each continent, with sci-fi for Antarctica. But that's more for the days diversity challenge than anything else. I used to run summer reading for teens in my first library job, and this is exactly the kind of thing I would have come up with. It would be a fun challenge for adults, too! Our summer reading program is book focused and my kids love participating. For 0-preschool it is early literacy focused, but does involve reading as well. For K+ they get a prize for completing 3 activities (read for an hour, set a reading goal, read a non-fiction book, etc.). So they read for 3hrs to get one prize. The prize is a book. They have excellent options for books as well. Blueberries for Sal was one of the picture books and Geronimo Stilton was one of the chapter books. There are dozens of books to choose from and many are high quality. We do a bookstores summer reading too which is 100% book focused and has kids reading from a variety of genres to fill out a bingo card. It's been a long time, but we always did the summer reading program. It was more of an excuse to go to the library once a week and talk to our favorite librarians. There was one year that one of the girls was bound and determined to win Dragonology, but other than that I don't remember any interest in prizes. It was more a chance to have the librarian look at their log and chat briefly about what they were reading. I don't do the adult reading program because of the record keeping involved. I don't need to post my reviews in one more place!